Because is used to show/give reason. It is followed by a complete sentence with its own subject and verb. Even if means whether or not. It is used to emphasize that something will still be true if another thing happens. •She usually eats at home, because she likes cooking. •The girl ran because she was afraid. •Even if you take a taxi, you’ll still miss your plane. •You will go to that cinema even if they don’t allow you. 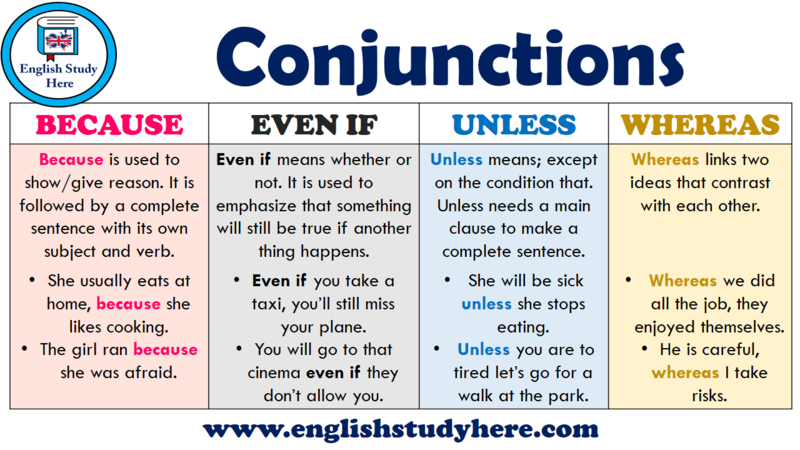 Unless means; except on the condition that. Unless needs a main clause to make a complete sentence. Whereas links two ideas that contrast with each other. • She will be sick unless she stops eating. • Unless you are to tired let’s go for a walk at the park. • Whereas we did all the job, they enjoyed themselves. •He is careful, whereas I take risks.